Henna is a natural ink derived from the henna plant. It goes on wet, then slowly dries. After flaking off, it leaves a beautiful design on your skin. This design lasts from a few days to over a week, depending on care. We love the beautiful and intricate designs shown here, and our stylists can do many more! From traditional henna designs, to modern symbols, to words, check with your local salon to see what they can do for you. Our prices depend on size. The reason for the plus signs is because prices at this range depends on the area covered and the intricacies of the design. Please consult your local salon for more information. Henna is offered at every one of our salons, except Northgate San Rafael CA. Many of our employees are able to do henna, but not all. Please call your local salon to make sure a henna-talented stylist is scheduled! Our ink is brown and all-natural as it's derived from the henna plant. We do not use black henna ink, because its color is derived from a potentially dangerous chemical. As such, please keep in mind that the henna's appearance depends on skin color, and may not show up as well on certain skin. 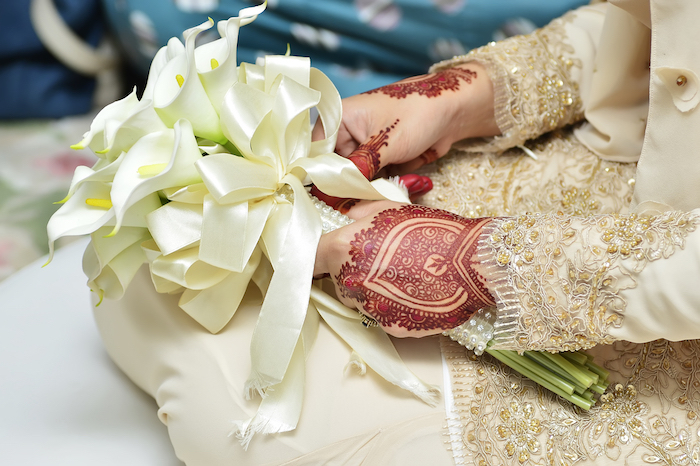 Certain locations can offer bridal henna and henna parties. We would love to travel to you, or have your group join us in our salon. Please call for a consultation.